After the v4 upgrade, my library scan hangs at 88%. After looking at the log, it looks like it does finish sometimes, but it takes 30 minutes to complete. Other times it appears to bomb out and start over. Either way, once it finishes, it starts right back up. Before the upgrade it took less than a minute. All Plugins have been upgraded and the server has been rebooted. I have disabled ipv6 and subtitle downloads per other users questions. I also upgraded to 4.0.1.0 last night and I have the same results. I have attached my server log. Do you by any chance have the libraries set to monitor for change and are adding new content to these libraries? Real time monitoring is turned on, but I am not adding content all day long. The scans start, run for 30 minutes, stop, then start again all day long. It did not behave this way before upgrading. For kicks and diagnosing the issue could you turn that off on your libs to see if that stops it from constantly rescanning? I just turned it off on all my libraries. I will let you know how it behaves. According to the log the scan completed normally. It did not hang, it just had some periods of time where the % did not change a whole lot. Please let us know if this helps. Thanks. So far it is still sitting around the 88% mark during scans. I would consider this hanging up since it just sits there. This is not how it behaved prior to the update nor should a library scan take 30 minutes and then immediately start over. Do you have any other suggestions? Right now, I have left the real time monitoring off, but I don't think that is the cause. You have a log showing a completed scan. Why not just wait for it to complete? I do wait and it starts right back up as the log states. This is an issue and I would like it to be addressed. I can access my server at any point of the day and it will say 88.x% and sometimes I can actually watch it go from 88.x% down to 87.x%. Right now it say 88.3%. Can we start troubleshooting this issue? Could it be a plugin causing this? Could it be the update? Again, this did not happen before the update and you can not say scanning should basically run all day long except a few seconds out of each day. I will start removing plugins to see which ones, if any, are causing the issue. I will say this, I didn't install most of those, did they get installed during the update? Some of them are included with the server, but you can remove them if you don't need them. Update, I removed all the plugins you suggested, restarted Emby, and the library scan still taking 30 minutes. Gets to 87.7% and starts to very slowly increment .1% at a time. The other issue is, because the scan never stops (for more than a split second), the CPU usage stays around 13%. When I manually stop the scan it drops back down to 0%. Having CPU chewed up by a process that doesn't stop running is not a good thing. That is valuable resources that could be used for transcoding. Any one else have any suggestions? Worst case, I will revert back to my snapshot in vmware and try the upgrade again. 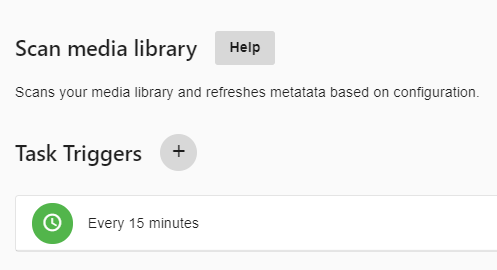 What triggers do you have setup for library scan, it appears to be firing about every 30 minutes? Edited by Happy2Play, 22 January 2019 - 09:46 PM. When I first setup Emby, I set it to 15 minutes and left it. Never had an issue before but I can try changing it. Does the Emby community have a recommended setting for this trigger? I would use the defaults. Happy2Play - I just deleted the trigger per your instructions and restarted Emby. It is now set back to the default 12 hours. I will let everyone know if this resolves it. Thanks for everyone's help!